Scientists used new theoretical models and high-speed movies of dice rolls to illustrate findings. Dungeons and Dragons, Yahtzee, and a huge number of other games all rely on throwing dice--from the 4-sided pyramid shape to the familiar 6-sided cube and the monster 20-sided variety. 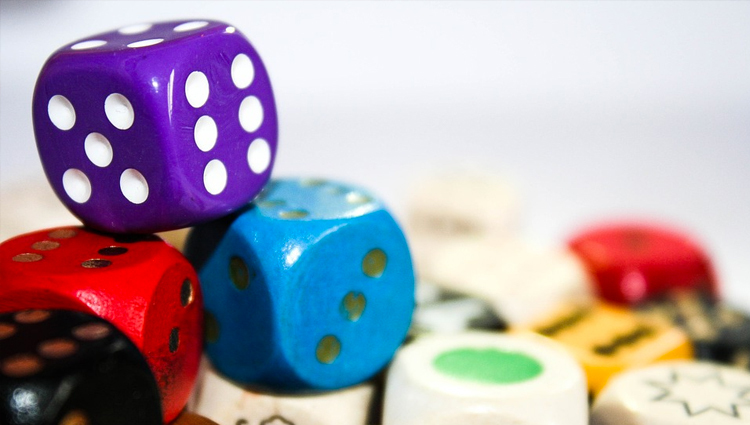 The dice are meant to introduce an element of chance to these games; we expect that the outcomes of the rolls will be truly random. However, new theoretical models and high-speed movies of dice rolls of numerous shapes and sizes confirm this is not strictly the case. They show that dice thrown with a 1 on the top are slightly more likely to land as a 1 than as the other values for every type of the various kinds of dice they studied. But at the same time, it's usually too hard for someone to predict the outcome of the throw of a single die--you'd have to know the starting conditions of the throw and its environment so precisely that for all practical purposes, the result could be considered random. Exploring a question that was debated in the 17th century by scientists and mathematicians Blaise Pascal and Pierre de Fermat, and many others before and since, doctoral student Marcin Kapitaniak at the University of Aberdeen, Scotland and his co-authors created a sophisticated theoretical model of the die throw in three dimensions. They considered how the effects of gravity, air resistance, friction of the table, and other factors influence the outcome of the roll. In addition, they observed the fall of the die with a high-speed camera that could capture the die's trajectory at a rate of 1500 frames per second. What did they find to be the most important factor? "The initial position of the die," Tomasz Kapitaniak,of the University of Lodz in Poland, wrote to me in an email. Small changes in the position can significantly affect the outcome. Other factors are less significant. "The air resistance can be neglected," he said. Could gamblers use the knowledge from this paper to their advantage, by placing the desired value of their roll as the highest-lying face of their die? "I don't know how to use it practically in casino," Kapitaniak wrote. Players would have to know everything so precisely--most importantly, the exact position of the die--to be able to predict the results with certainty. On the other hand, casino operators won't ever be able to achieve 100% random rolls with dice. They often drill the pips--the little dots in dice--and fill it with uniformly weighted material in efforts to make all sides of the dice equally probable to come up in a roll. "Drilling the pips...gives the symmetry in the die but symmetry is not enough" to make it random, he said. "[The] top face will always be more probable." A die roll is chaotic only if it bounces on the table an infinite number of times, according to Kapitaniak. But this is far from attainable, due to the fact that the die loses energy with each bounce due to friction. With the high-speed camera images and the new theoretical treatment, this paper provides a new contribution to the question of the true randomness of dice throws and coin tosses. It contributes to an increasingly sophisticated understanding of what can be considered fully random in everyday life. And in a more practical vein, if you're playing Dungeons and Dragons tonight, it probably wouldn't hurt to start your roll with the coveted 20 on top--it may occasionally give you the desired results, while Dungeon Masters could insist on playing on the roughest, highest-friction table they can find. The work will appear in an upcoming issue of the journal Chaos.